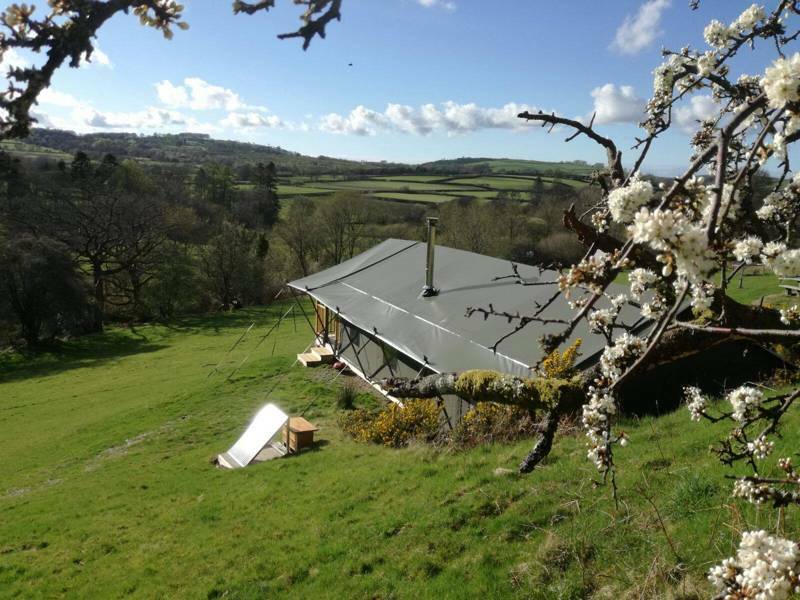 On the lush, green slopes of the Teifi Valley, Amanda and Ken Edward’s charming smallholding is the centre point for their diverse enterprises. In a small workshop, Ken crafts Welsh oak and chestnut into bespoke furniture, while the hens scratching outside supply eggs to the organic farm shop. Their 170-year-old farmhouse is also the quaint setting for a bed & breakfast, where the aroma of wholesome home-cooking wafts through the open window to the manicured garden beyond. Here, tucked in a private space with stunning views, another of the couple’s fine-tuned ventures tempts in holidaymakers looking for a cosy, rural bolthole. 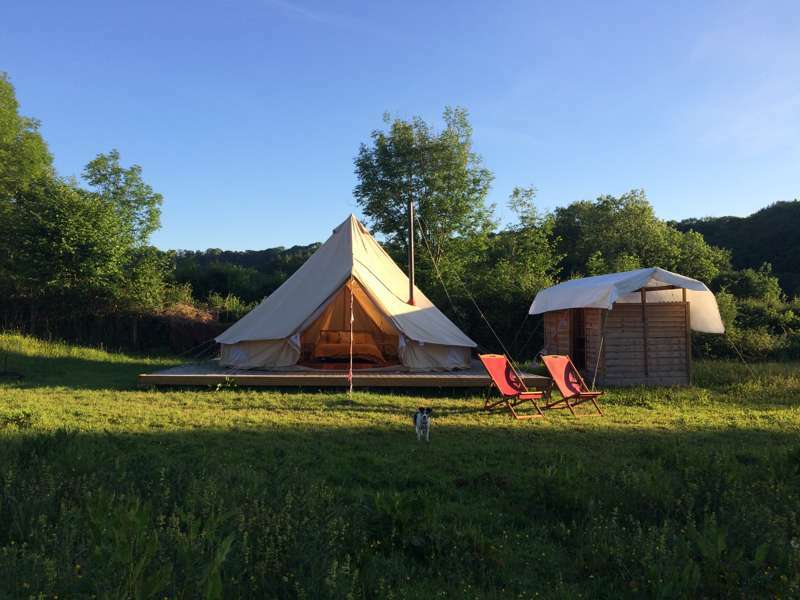 Nantgwynfaen Organic Farm offers something for everyone with a delightfully intimate five pitch campsite supplementing an impressive glamping retreat. For starters, there’s The Glamavan – an aptly named lodging for those who want a hassle-free holiday with all the furnishings of home. This large retro static caravan is finished with everything you need, including a fully-fitted kitchen with gas oven cooker, microwave, kettle, toaster, fridge, sink and kitchen utensils. There’s a bathroom (with shower), a TV and DVD player and oil paintings hanging on the walls. The double and small twin rooms are divided from the main space, while a large bay window seat provides ample space to sleep a fifth person. 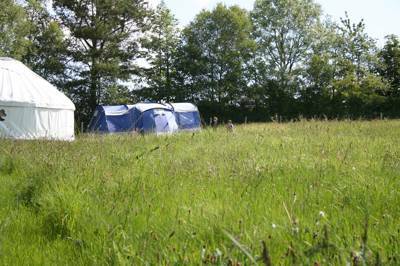 For camping purists wanting to pitch their own tent, there are five cannily crafted plots secreted amongst the grounds. 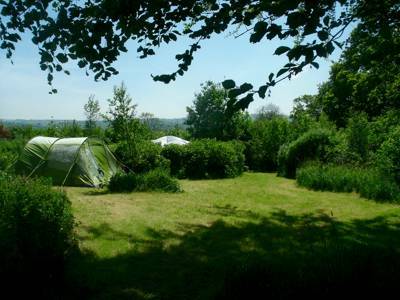 These peaceful, private pockets are all unique, with one beside the woodland, another overlooking the valley and a special one amongst the fruit trees. 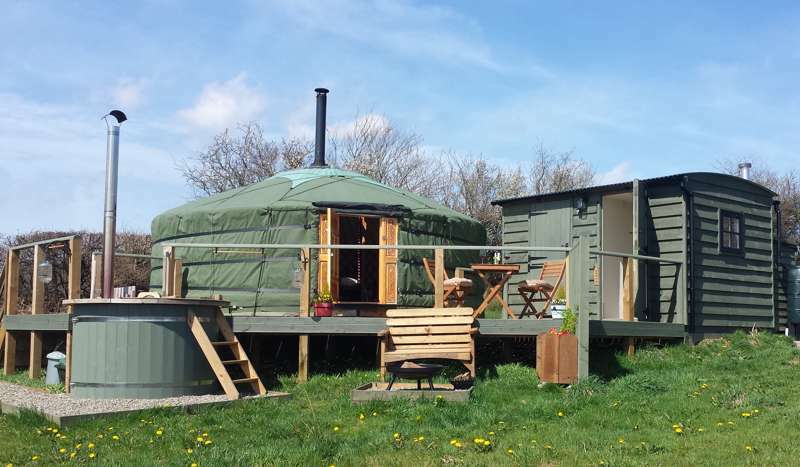 Fires are permitted on most and one is also equipped for a small caravan or campervan. 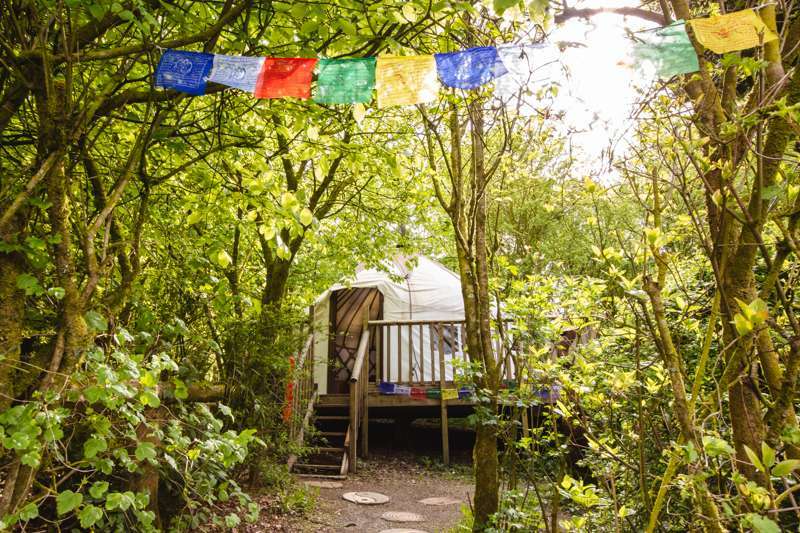 Whichever spot you opt for, you’ll be guaranteed West Wales nature in all its glory, including buzzards and red kites circling majestically overhead. Step out from the retro Glamavan interior and enjoy a BBQ in the sun, or stock up on lovely local and organic produce from the onsite farm shop. Guests can also make the most of the B&B by ordering one of the farm’s home-cooked breakfasts to enjoy in the stone and slate farmhouse. As local sausages sizzle in the pan your nose leads you back round to the stone and slate farmhouse where an old, lime-washed milling barn has been transformed into a rainy day hideout. Beneath a beamed roof, a well-stocked games room awaits the kids, while, when the sun returns, a Wendy house promises outdoor fun. The best idea, though, is to slip on your wellies for a wander around the farm. 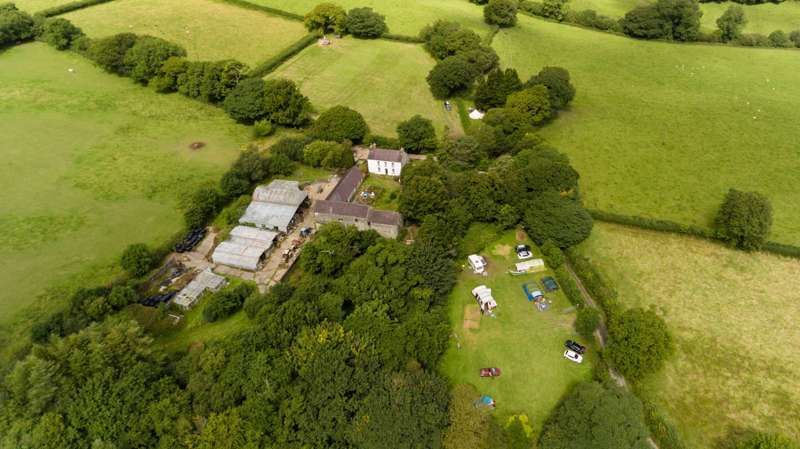 The babbling streams, colourful orchards, sociable animals and plentiful wildlife make Nantgwynfaen Organic Farm an easy place to lose track of time. And with the added comforts of the Glamavan you’ll be in no rush to get away. When you do jump back in the car, this rural farmstead is poised in prime position to see the best of West Wales. A 30 minute drive takes you straight to the coast and to the charming fishing village of New Quay, it’s houses stacked upon the hillside. To the south, Pembrokeshire National Park boasts some of the UK's most dramatic sea-carved scenery. 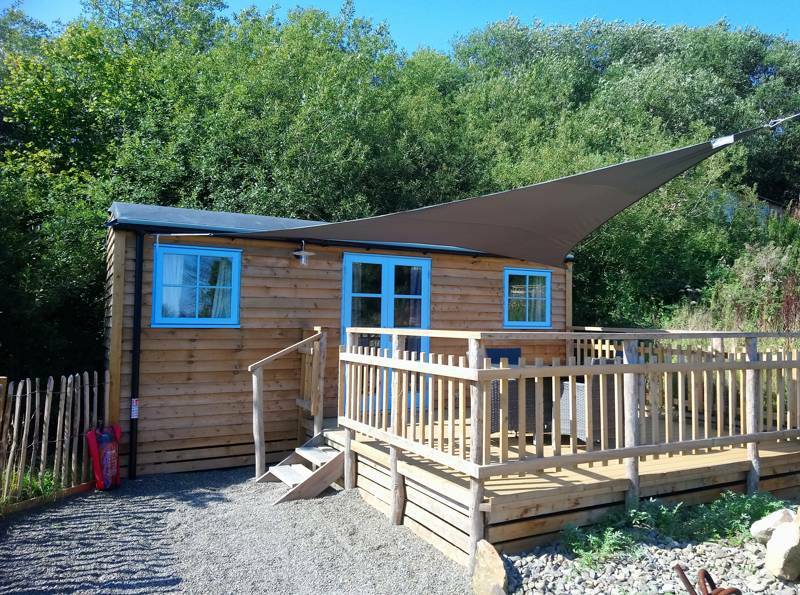 Excellent fishing and pleasant walks can be found on the banks of the River Teifi, the longest river in Wales and the natural sculptor of the views you enjoy from the comfort of the Glamavan. 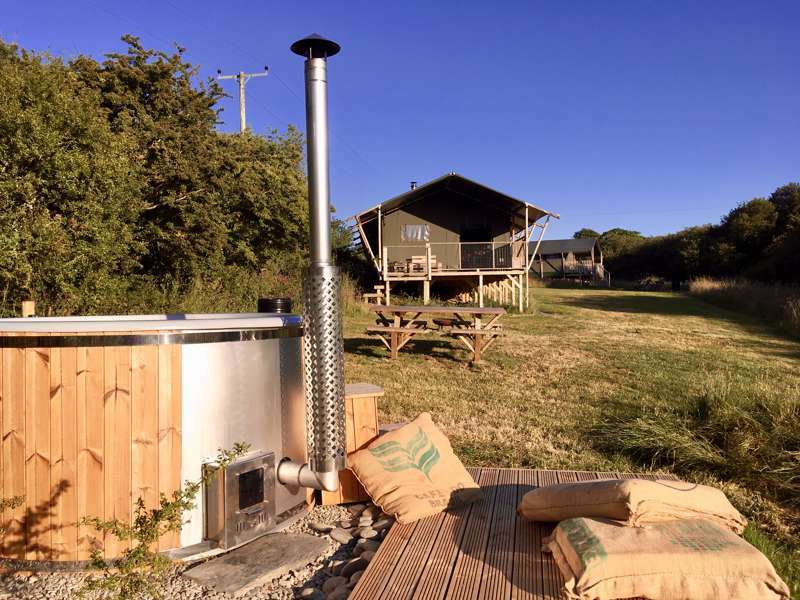 Nantgwynfaen Organic Farm is a working farm set in beautiful West Wales. Here is a place where you can experience peace and tranquillity – unwind surrounded by green fields, with wonderful views. There is birdsong all day and a dark sky at night to observe unpolluted heavens. Just a short drive will take you to the dramatic coast of Cardigan Bay with its magnificent sandy beaches, the coastal path and Bottlenose Dolphins. Drink at local microbreweries, eat wood-fired pizzas, walk to the gin distillery and cheesemaker. The farm itself prides itself on its green credentials and award-winning accommodation. There is a games barn with table tennis and pool table – a refuge from the elements, and a cool space when it is sunny. The farm shop is stocked with local organic produce and homemade bread to order. Organic breakfasts are available to all guests in the imposing traditional farmhouse. Picture yourself gathered around a campfire on a warm summers evening surrounded by ancient ash trees. Look up and watch the swallows, red kites, buzzards and later on the bats and owls. With just the scent of roses and honeysuckle and wood smoke what more could you want. Isn’t it every campers dream to find such a place where you can be alone in a secluded glade with only your friends and family? Walks from the doorstep around the lush 60-acre farm, climb Mary’s hill, find the dingly dell, pooh corner and the sound of music trees and help collect the eggs in the morning. If camping is not for you and you always wanted to experience glamping, The Glamavan is the perfect solution. Here you can experience the same benefits as the campers, but enjoy the luxury of your own home in a vintage-style retro-chic static caravan. With crisp cotton sheets and all the conveniences of a well-equipped home, this is deluxe camping, the answer for anyone who wants camp effortlessly. For latest availability and best prices for Nantgwynfaen Organic Farm Wales, please use the Date Search above. 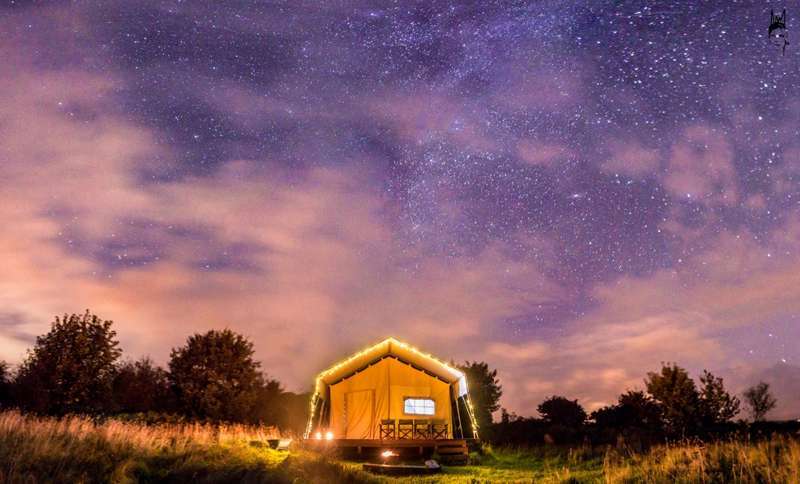 A static glamping van plus 5 grass camping pitches (including 1 hardstanding suitable a small campervan or caravan). The Glamavan has a toilet and hot shower, is fully furnished and has a well-equipped kitchen. There's a double room, a twin room (with short narrow beds) and in the living area a large window seat is easily big enough to sleep a 5th person. 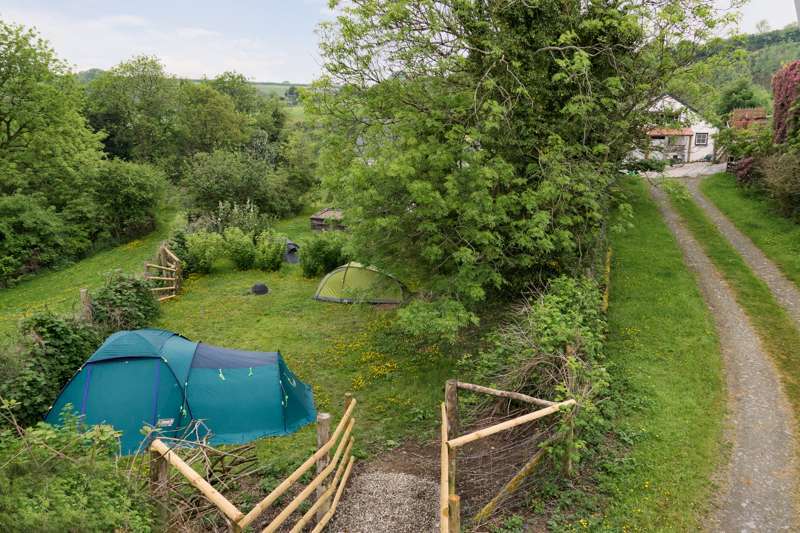 Camping facilities include include free hot water, a shower (from a plumbed in watering can), flushing toilet, washing-up station with free hot water, and free Wi-Fi. For kids, there's a Wendy house and play area along with a games room with table tennis, darts and a pool table, plus many animals of the farm to meet or help Ken collect eggs from the hens. Campfires permitted in the firebowls provided (wood and local charcoal is available for sale locally and in the farm shop). It's a short drive to Cardigan Bay, famous for its bottlenose dolphins. The Ceredigion Heritage Coast is home to lovely seaside towns and villages like Llangranog – where you can go dry-slope skiing – and New Quay, a wonderful little fishing village a few miles south from the colourful harbour town of Aberaeron. There's a host of good beaches and an array of great walking routes, while further south the Pembrokeshire Coast Path (08453 457275) takes in the best of the National Park (08453 457275) and its dramatic coastline, as does the longer Wales Coast Path. The National Wool Museum (02920 573070) is a short drive from the campsite, while Newcastle Emlyn is 10 minutes away and boasts the ruins of a 13th century castle, good restaurants, and a country market every Friday. The River Teifi offers trout fishing, walking trails and canoeing in most places. There's a farm shop on site specialising in local and organic produce. There is a fully furnished kitchen in the Glamavan, but breakfast can be served from the farmhouse (£15/pp). There's also a BBQ. A couple of miles down the road lies The Daffodil Inn (01559 370343) at Penrhiwllan, a cracking gastropub with stunning views of the Teifi Valley countryside from its dining room. 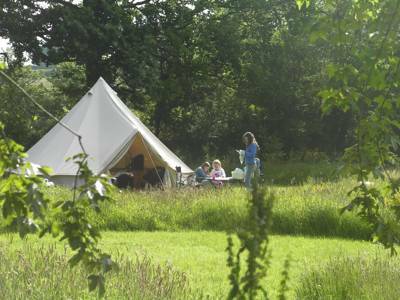 Camping: £10/£5 per adult/child per night. Campervan: £20 per night (includes 2 people). Additional adults/children £10/£5 per night. The Glamavan: £50–£70 per night. The postcode is SA44 4SR Nantgwynfaen is the only address at that postcode. The farm is 2 miles from Llandysul, at Croeslan, just off the A486 on the Penrhiwllan road. From Croeslan on the A486 take the lane that is sign-posted Penrhiwllan adjacent to the two lay bye bus stops. It is the first farm track on the right (the telephone wires stop at the end of the drive). From Newcastle Emlyn take the Lampeter road out of the town past the health shop. Carry on straight through Llandyfriog and Aberbanc. At Penrhiwllan turn left at The Daffodil Inn, immediately after the shop, signposted Croeslan. Carry on up the lane for 2 miles. After passing a lane on the right, Nantgwynfaen is the next farm track on the left. If you reach the main A486 road at Croeslan, you have gone too far! Trains run from London Paddington to Carmarthen and take approx. 4 hrs. From here you can hire a car or get the bus to Henllan. Cyclists welcome, near Sustrans route 82. Spy real, live dragonﬂies dancing over lily-rich ponds as you head out in search of sleepy dragons in the wooded wonderland at this quiet eco site.